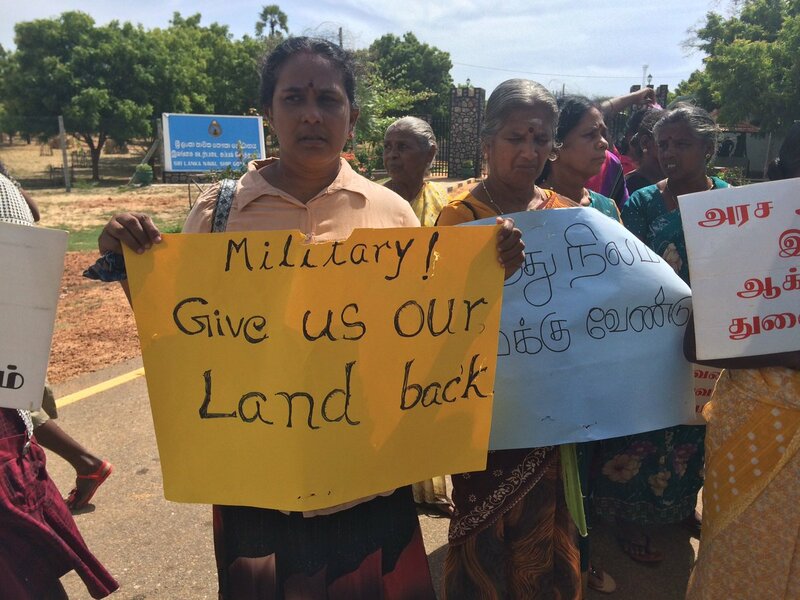 They are demanding the return of their land, which has been occupied by the Sri Lankan army since its 2009 victory over the Liberation Tigers of Tamil Eelam (LTTE). Kilinochhi had been the de facto capital of the LTTE, which fought for an independent Tamil homeland in the north and east of the island of Sri Lanka. Throughout the north and east, Tamils are trying to recover their land. They are resisting attempts by the army and other agencies of the Sri Lankan government to take more land. During the war, large areas of land were taken over for military use. These areas were declared “high security zones”, and inhabitants were evicted. Since the end of the war, some land has been returned to its Tamil owners. But at the same time, new land seizures have occurred, causing more Tamils to be forced off their land. New military bases have been built, and civilian Sri Lankan government departments have also been involved in land seizures. The forest department, for example, claims the right to control any area with trees in it. When Tamils who were displaced during the war return to their land, they often find it has been overgrown with jungle. If they cut down these trees, they are threatened by the forest department. According to the Tamilnet website, “After 2010, the resettling people had to clear their agricultural lands. But the SL [Sri Lankan] Forest Department is now threatening them with lawsuits saying they were engaged in illegal destruction of forestry. “People having documents of ownership to these lands don’t count. If there are traces of big trees, the SL Forest Department claims the lands as coming under its jurisdiction. Settlements made up of members of the Sinhalese ethnic majority are being established in Tamil areas. Just as Jewish settlements in the occupied West Bank are aimed at blocking the creation of a Palestinian state, the Sinhalese settlements are aimed at preventing any possibility of an independent Tamil state being created at some time in the future. Tamils have resisted land seizures through court cases and protest action. For example, in the coastal village of Palli-munai, the Sri Lankan army had seized 25 houses and a fish market in 1990. In 2013, the displaced families filed a lawsuit to get their land back. In August, they took protest action to block government surveyors from carrying out survey work on the land, apparently in preparation for some sort of military construction work. On September 5, the displaced families won a small victory when a judge ruled that surveying work should not occur until the court case is decided.